A non-food item from the Budget Bounty kitchen today. Instead, here’s something to contribute to a bit of self-pampering. It’s also a great DIY gift idea for kids to make for future Christmas or birthday gifts. A few years back, sugar scrubs were on sale everywhere. At this time of year skin suffers. Whether you are in the summer of the Southern Hemisphere, or in the winter of the Northern Hemisphere, you are more than likely to be having some dry skin issues right about now. Dull, itchy skin does not a good holiday season make. 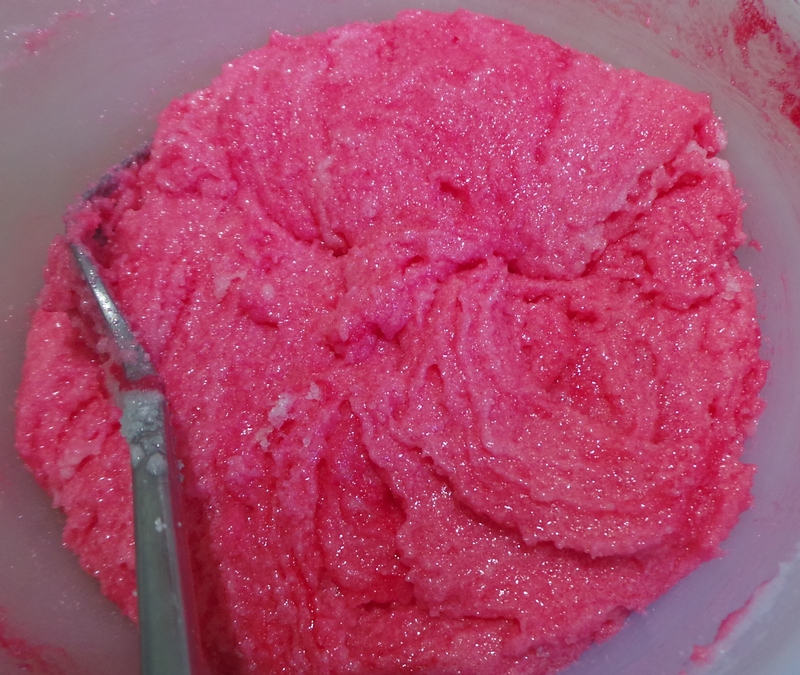 Take a few minutes and some affordable ingredients and make yourself a nice exfoliating/moisturising scrub for your morning tub. All you need is some sugar and some Sorbolene. It also works far better here than more expensive lotions. These tend to separate; you will end up with a container half-filled with a concrete-like sugar substance and half-filled with water. Get yourself a container in which to put some sugar. You want something with a wide mouth that you can fit your hand into. 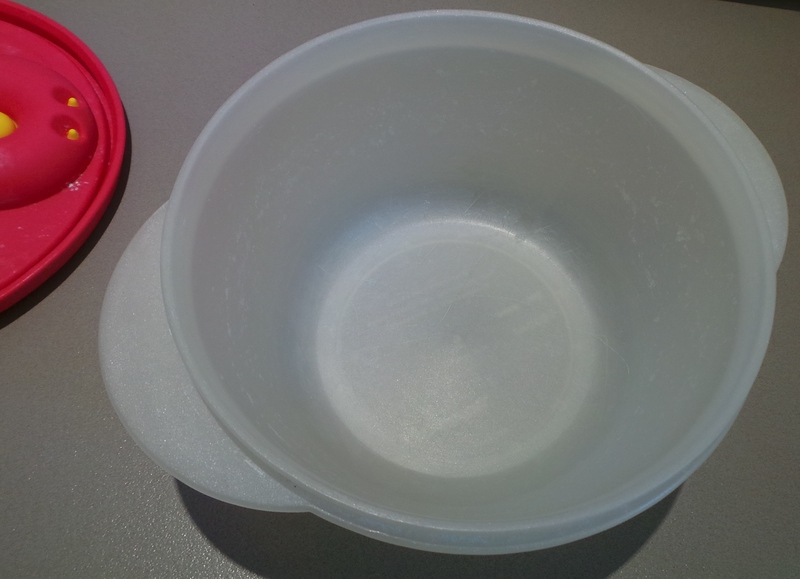 I use an old Tupperware microwave container, but a wide-mouthed jar or a plastic takeaway container would also do. A very old Tupperware microwave container. Whatever you choose, make sure it has a tight-fitting lid. This will be living near your shower if you are anything like me, and you will be wanting to keep it relatively water free. 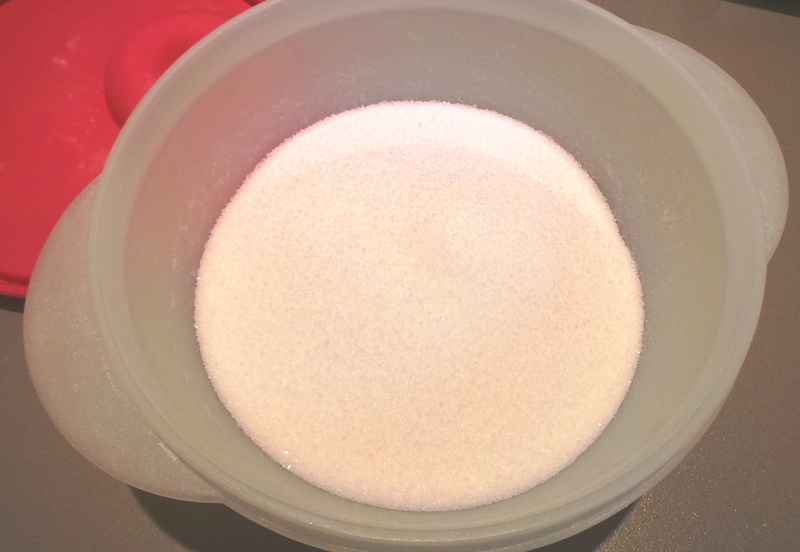 Fill your container ¾ full of plain, white, table sugar. Put some sugar into your container. Now, if you wish, you might want to add a few drops of essential oil. I don’t particularly like the smell of Sorbolene, so a few drops of a scented oil make this a much nicer product for me. Don’t compromise and use any old scented ‘oil’ that you’ve spent mere dollars on here. Essential oils are expensive, but you use them a drop or two at a time and they will last for years if stored correctly. In my small collection I have a bottle that I’ve had for 20 years; it’s only half full now but still smells as wonderful as the day I bought it. Go to a local health food shop or similar and look at the range – both scents and prices. A lavender oil isn’t going to cost you as much as a Damascus Rose oil, and Peppermint Oil will cost even less. 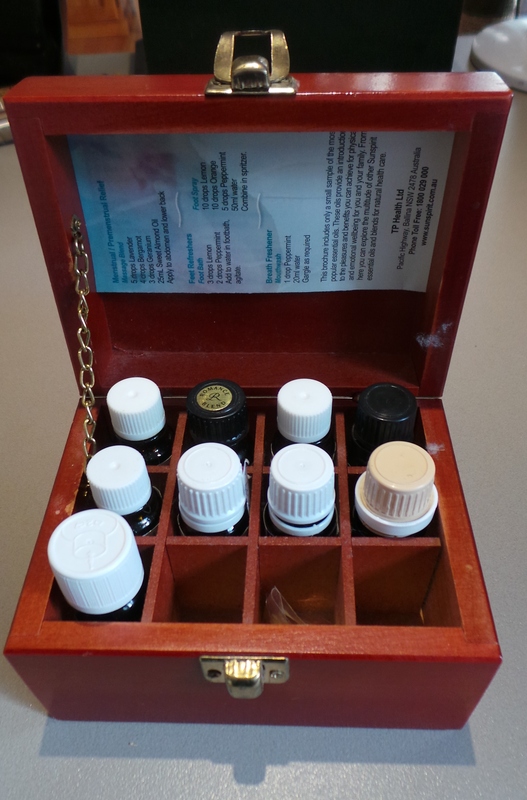 My little stash of essential oils. Also, be aware that some oils may interfere with medications when absorbed through the skin and some should not be used in certain situations such as pregnancy. Check with the person you are buying them from. If you can’t make up your mind, try sandalwood oil. It’s a nice starting scent and has been used as a perfume since forever (actual archaeological term). So, shake a few drops of oil onto your sugar. I mean a few. These oils have a very strong scent. Add a few drops of scented oil to your sugar if you wish. 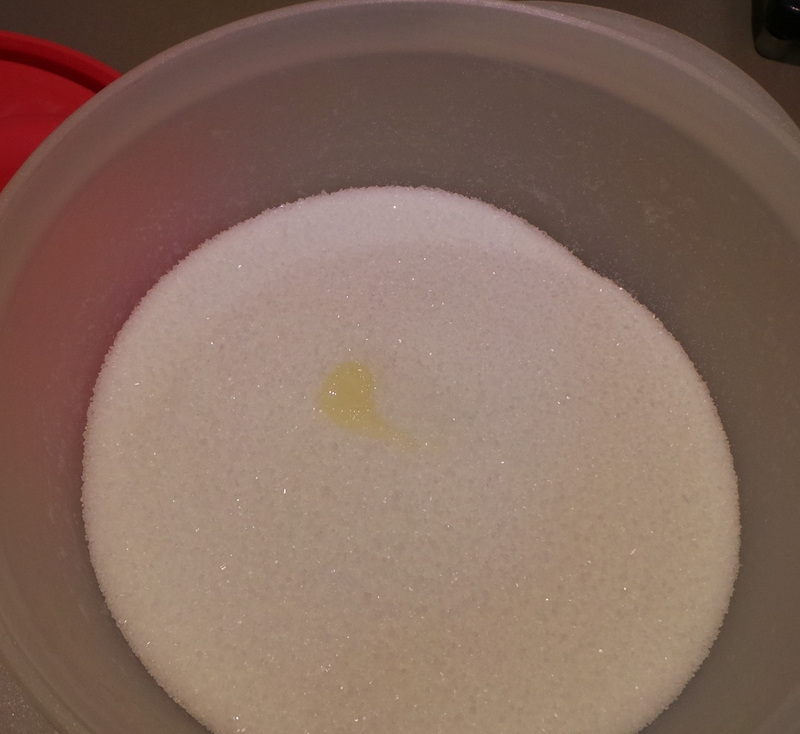 You’ll be able to see the oil against the sugar as in the photo above. 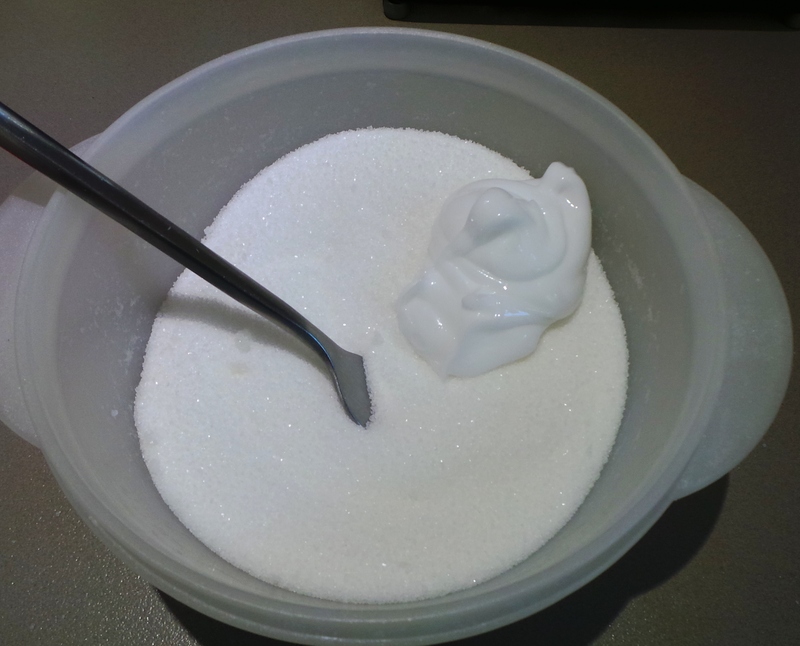 Use a fork to break up the lump that will form with the oil and mix it through the rest of the sugar. Now add your Sorbolene a tablespoonful at a time, mixing thoroughly with your fork. It will start to come together. 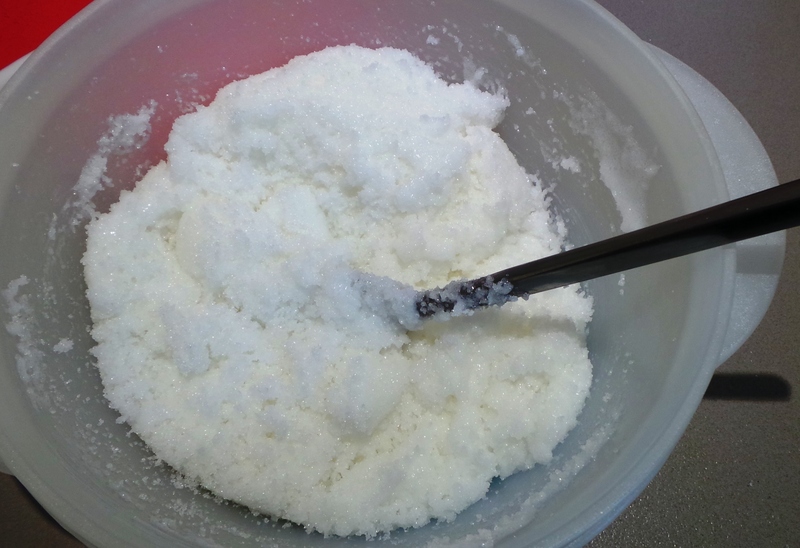 Continue adding the lotion until you have something that resembles toothpaste in consistency. You’re looking for something that looks like a gritty toothpaste. To use, simply get under the shower and apply by rubbing onto your wet skin. The sugar will exfoliate and remove any rough or dry skin patches and the sorbolene will trap moisture and leave you feeling silky smooth all day. The best part is that you won’t have to skimp on using it because it is so simple and affordable to make! This scrub can also be made using oil instead of Sorbolene, but that will add considerably to the cost and may make your bath/shower quite slippery and dangerous for you (or anyone who uses it after you!). You may also wish to try using table salt instead of sugar. This is NOT something that everyone could tolerate. Make a small test sample and try it somewhere that isn’t too sensitive before you go making a big batch for all over use.